Coronation Street The Tour entrance is via Atherton Street (off Quay Street) or Great John Street (off Lower Byrom Street) in Castlefield, Manchester. Use postcode M3 4FD (they share this postcode with the Great John Street Hotel which is located opposite). Since they opened, they've welcomed over half a million visitors from across the world. Coronation Street The Tour will continue to welcome guests until the 31st December 2015 and all remaining tickets have now been released. 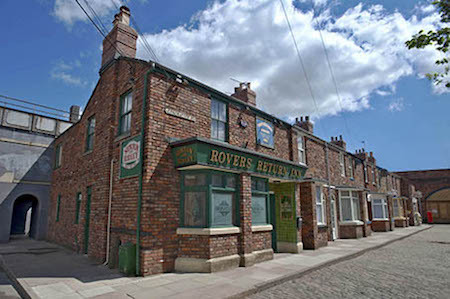 Your visit starts with a 50 minute guided tour of the backstage areas and the studio with a specially edited montage film and seven interior sets including the rovers Return where you can take the opportunity to have your souvenir photograph taken behind the bar of the Rovers Return. You'll then be able to walk down the cobbles of Coronation Street and explore Weatherfield at your leisure. Find out more with our 20 minutes guided Street Tours now running throughout the day, every day; all included in your ticket price.